When I was growing up there were no summer blockbuster films with superheroes being put out every year – that’s a pretty recent phenomenon. So, where did girls find female superheroes? In my little slice of the ’80s we’d catch them through our black & white TV on the occasions when there was electricity, and when the government decided to schedule some fun shows. So my favourite superhero chick is The Bionic Woman, played by Lindsay Wagner from 1976-78. And that’s what we’re talking about this week – celebrating Labor Day through remembering our kickass favourite female superheroes. While I don’t remember individual episodes or fantastic feats by the Bionic Woman I can recall being mightily impressed by her strength, her fast running and her outwitting of bad guys. Her backstory is that she was the love interest of the Six Million Dollar Man, and while out skydiving with him her ‘shute failed and she cracked her noggin, right arm and legs when she hit earth. He appealed to his scientist buddies to humpty-dumpty her back together again, and they gave her speedy legs, a prosthetic right arm capable of crushing metal, and a supersonic hearing implant. The only catch is now that she has all this new gear she has to work with her beau for the Office of Scientific Investigation (OSI). The Bionic Woman used her strength to outmaneuver her enemies but she didn’t use it to harm them. And she didn’t run around in tights and a bikini with a cape, unless undercover as a showgirl. I guess you could consider her the precursor to the Alias character, Sydney Bristow – who was also a kickass undercover operative, minus the bionic powers. 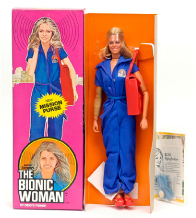 And check out the Bionic Woman action figure, no cleavage and no spandex, amazing! I especially like that the Bionic Woman shows were just as popular as the Six Million Dollar Man ones, that they both went off the air at the same time, and came back together in 3 TV movies. How bout that? Equality between the bionic sexes. Woot Woot.